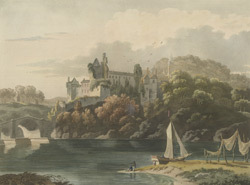 View of Lismore Castle in County Waterford, Ireland. The castle is strategically situated overlooking the Blackwater River and has views of the surrounding valley. The first castle on this site was built by Prince John in 1185, it was handed over to the church and was used as a Bishops Palace until 1589. After this time the castle was privately leased- one of the more famous people to live here was Sir Walter Raleigh. As can be seen in this aquatint, parts of the castle fell into disrepair during the 18th century and it was even described as a ruin. In 1800s the sixth Duke of Devonshire commissioned architects and designers like William Atkinson and Joseph Paxton, the designer of Crystal Palace, to renovate the castle.